Losing an internet connection is a common problem that most of us experience. This could be very annoying especially if you need to get online to finish deadlines and other school work. An SEO company or any other online business is not an exemption. Work is easily affected with connectivity issues. But before calling your Internet Service Provider, basic troubleshooting may help restore your connection immediately. You may have lost that connection due to some lose connections in your cables. So check that all your cables are properly connected from the modem to your computer. You may need to boost your connection by rebooting your computer. Close all browsers and other windows then prepare to restart your computer. If this does not work, you may need to tweak your settings. For windows 7 and higher, you can easily troubleshoot your system. Look for the icon that shows your connection. If you are connected via wifi you will see the icon that looks like signals on the system tray. If you are connected via LAN network, you will see the small computer icon with a LAN cable beside it. It is usually located at the right lower corner of the computer screen near the time and date. When you locate the icons for your connection, right click on it and then choose troubleshoot problems. Wait for it to check on your system to detect the problem. It may ask you to remove all cables and turn off the modem. Wait for a good 10 seconds and then plug all cables back in and turn on your modem. Wait for the lights to come back. Make sure that the internet light is blinking as well as the LAN light. Test your connection. Try opening a browser. If this does not work, you may need to click on the icon again for your connection and choose troubleshoot connection. This time, let it go ahead and finish scanning. This step usually fixes the problem. If it detects an ethernet issue, just make sure that your ethernet cable is properly connected. If it says DNS issue, you may want to explore the fix that it suggests or you may release or renew your IP by doing the IP config. 1. Click on start, select run, then type CMD, then click ok or hit on enter from your keyboard. 2. A black screen will open. Type in ipconfig/release then hit on enter on your keyboard. 3. Type in ipconfig/renew then hit enter. This step should release the old IP and renew your IP configuration. 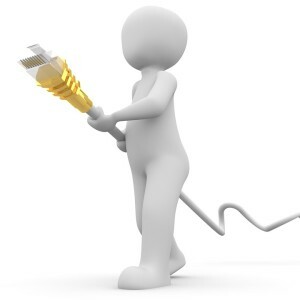 If this does not work for you, then you may call your Internet Service Provider to check on connections in your area for possible ISP issues.